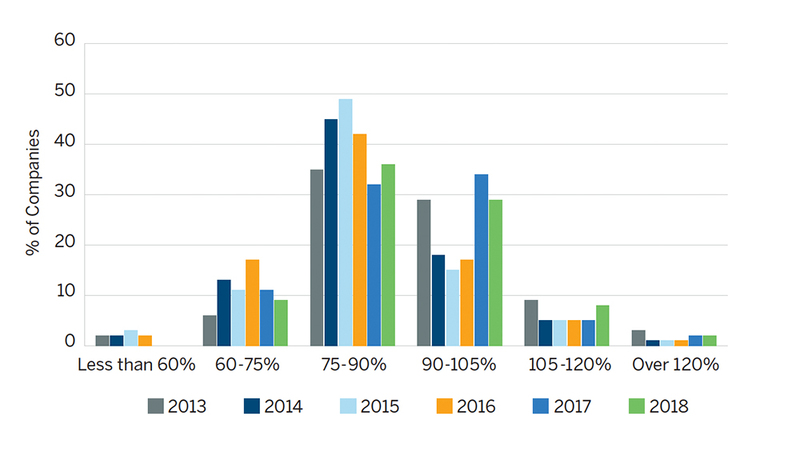 The 2019 edition of the Milliman Corporate Pension Funding Study (PFS) is our 19th annual analysis of the financial disclosures of the 100 largest corporate defined benefit (DB) pension plan sponsors. These 100 companies are ranked highest to lowest by the value of their pension assets reported to the public, to shareholders, and to the U.S. federal agencies that have an interest in such disclosures. 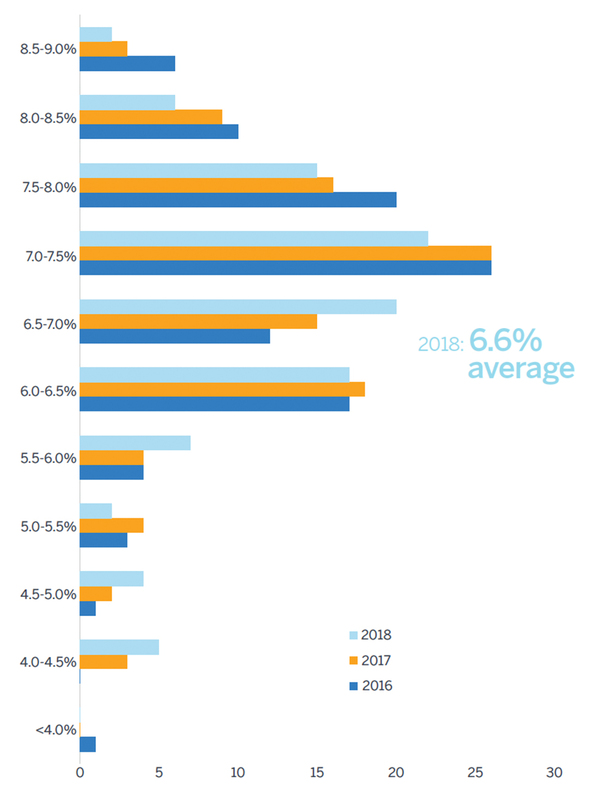 We’re pleased to report that, despite investment losses of 2.8%—the worst asset performance since 2008—the private single-employer defined benefit plans of the Milliman 100 companies continued to make funding improvements in 2018. The funded ratio for the Milliman 100 companies settled at 87.1%, an improvement from the year-end 2017 funded ratio of 85.8%. The funding deficit improved by $41 billion, ending the year at $215 billion. Sixteen plans had a funded ratio of at least 100% compared to 15 plans from the 2018 Milliman PFS. Corporate plan sponsors continued last year’s trend of higher contributions, totaling $57.5 billion. Thirteen of these employers contributed at least $1 billion and three of these contributions were among the top 10 largest contributions in the history of this study. Lockheed Martin Corporation made a $5.0 billion contribution (8th largest in the history of the study), General Electric made a $6.8 billion contribution (4th largest), and AT&T made a $9.3 billion contribution (2nd largest, only topped by a General Motors contribution of $19.1 billion in 2003). Employer contributions have totaled nearly $120 billion over the last two years; this amount exceeds any two-year period in the history of our study. The disappointing 2018 investment performance of global equity markets, coupled with rising interest rates in 2018, resulted in the first year of investment losses since 2008, with an average loss of 2.8%. These investment losses reduced plan assets by $43 billion compared to the expectation that investment gains would add at least $97 billion, based on the companies’ long-term investment return assumptions. In addition to large contributions, the funded status improvements in 2018 were driven by the discount rates plan sponsors used to value pension liabilities. The average discount rate increased by 52 basis points to 4.01% from 3.49%. This is the second largest one-year increase for the PFS. 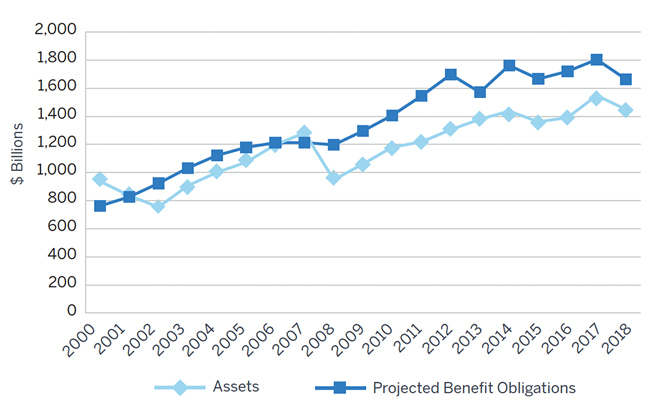 The pension benefit obligation (PBO) of the Milliman 100 plans declined to $1.66 trillion, down from last year’s all time high of $1.80 trillion. Pension expense (the charge to the income statement under Accounting Standards Codification Subtopic 715) declined to $16.2 billion in fiscal year (FY) 2018 from $20.3 billion in FY2017. Although this continues the trend of the past several years, following the all-time high of $56.5 billion in FY2012, it is likely to be reversed in FY2019. We noted a modest decline in the life expectancy assumptions; participants and pensioners will not live as long as previously assumed based on use of the latest mortality tables published by the Society of Actuaries. The change in life expectancy assumptions reduced the actuarial present value of the PBO. During FY2018, pension settlements or pension risk transfer (PRT) programs continued to be seen as prudent financial cost management by plan sponsors. Among the Milliman 100 pension plans, settlement payouts totaled $18.8 billion in FY2018 compared to $12.7 billion in FY2017. PRT settlements result in a measurable reduction in future premiums to be collected by the Pension Benefit Guaranty Corporation (PBGC). Like the Milliman 100 pension plans, the PBGC reported a large funded status improvement for the corporate pension plans under its custody in the federal fiscal year ending September 30, 2018. The PBGC recorded a 102% funded ratio for the plans that terminated (when the sponsoring employer filed for Chapter 11 insolvency) and were sent to it as the receiving custodian. (We note that plans the PBGC expects to terminate are also included.) This is up from the 91% funded status reported at September 30, 2017. This change was driven by a large decrease in liabilities caused by the measurable increase in the generally conservative interest rates the PBGC sets. Despite an increase in the PBGC flat dollar premium rates, the PBGC’s total premium income decreased by 18% in FY2018 due to the improved funded status of corporate pension plans ($5 billion, down from $6.7 billion). We speculated in last year’s study that, as a result of the Tax Reform Act of 2017, the reduction of the corporate marginal tax rates to 21% in 2018 from 35% in 2017 could cause plan sponsors to implement certain strategies concerning the recognition of contributions in a specific tax year so as to maximize deductibility of plan sponsor contributions. If they did so, it was not widely disclosed, as only three companies reported in Form 10-K disclosures that they made increased contributions due to the new tax law. Five companies exited the Milliman study due to mergers, reductions in the market values of pension plan assets, or a delay in releasing their financial statement. Aetna was acquired by CVS. Edison International, Hartford Financial Services Group, Inc., and Kimberly-Clark each had a market value of assets that was too low to be included in the 2019 PFS. Lastly, Kraft Heinz did not release their 10-K disclosures in time to be included in the 2019 PFS. Five companies are new to the Milliman 100: CVS, DXC Technology (a spin-off/merger involving Hewlett Packard Enterprise and Computer Sciences Corporation), Sysco, Parker- Hannifin, and United Continental Holdings. 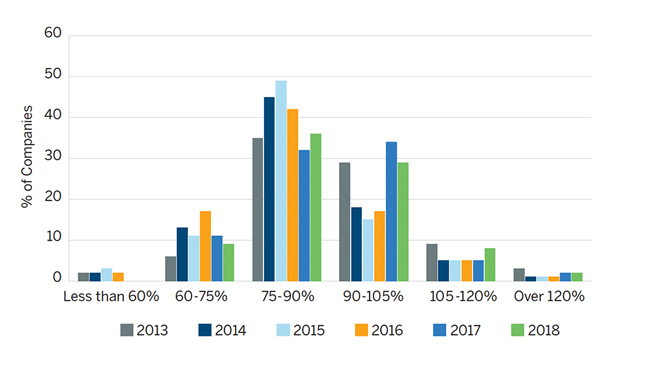 Nineteen of the Milliman 100 companies indicated they have adopted or plan to adopt “spot rate” approaches for calculating pension expense during FY2018. Last year’s study noted that 43 companies had included such disclosures for 2017 fiscal year expense. Once companies adopt use of a spot rate approach for computing pension expense, it is unlikely that auditors would allow a switch back to the traditional method for computation of pension expense barring exceptional circumstances. It is also unlikely that companies already using a spot rate approach will continue to highlight it in their 10-K disclosures, which explains the comparative decrease noted in this year’s PFS. Pension risk transfer activity from the plan sponsors to insurance companies continued in 2018. FY2018 pension risk settlement payments to former—but not yet retired— participants continued as well. We have estimated that the sum of the pension risk transfers to insurance companies (sometimes referred to as “pension lift-outs”) and the corresponding settlement payments totaled about $18.8 billion, compared with $12.7 billion in FY2017. Examples among Milliman 100 companies include FedEx ($6.2 billion), Lockheed Martin Corporation ($1.8 billion), Entergy Corporation ($1.8 billion), and International Paper ($1.7 billion). These pension risk transfer strategies also relieve the plan sponsor of the PBGC premium payments that are required for the former employees, who are part of the participant head count. With any pension risk transfer strategy, employers must weigh the benefits of risk reduction against opportunity costs of lost pension assets and the prospects of paying premiums or additional costs beyond ordinary funding requirements in order to accomplish the third-party risk transfer. The Internal Revenue Service (IRS) released IRS Notice 2019- 18 in March 2019 indicating that it will no longer thwart the ability of a plan sponsor to offer a lump-sum settlement to retirees or their surviving beneficiaries. This action reversed the guidance issued in 2015 in which the IRS prohibited such lump-sum settlements to in-pay participants. The message to plan sponsors from the earlier guidance was, in effect, that the settlements were unlawful. We will cautiously speculate that PRTs will accelerate in FY2019 due to this reversal. Note: Numbers may not add up precisely due to rounding. In addition to defined benefit pension plans, the PFS tracks the actuarial obligations of postretirement healthcare benefits. FY2016 marked the first year that the aggregate reporting of these accumulated postretirement benefit obligations (APBOs) was under $200 billion (at about $196.0 billion). This trend continued in FY2018, with the APBOs decreasing an additional $24.6 billion from their FY2017 level to $168.4 billion. This is consistent with the trend by plan sponsors over the last decade of divesting other postemployment benefits (OPEB) liabilities. As we write this report in April 2019, we acknowledge that the year-end 2018 results do not reflect the favorable financial market investment gains in the first quarter of 2019. Equity market gains were in a range of 10% to 14%. Bond yields also declined, increasing the value of the fixed income portion of the pension assets. The investment loss on the pension trusts was 2.8%, when the expectation was a FY2018 investment gain of 6.6%. Reflecting the actual FY2018 loss along with the expected FY2018 gain, we estimate that there was a net investment loss of $141 billion. This is the first year since 2008 that there has been a negative investment return. 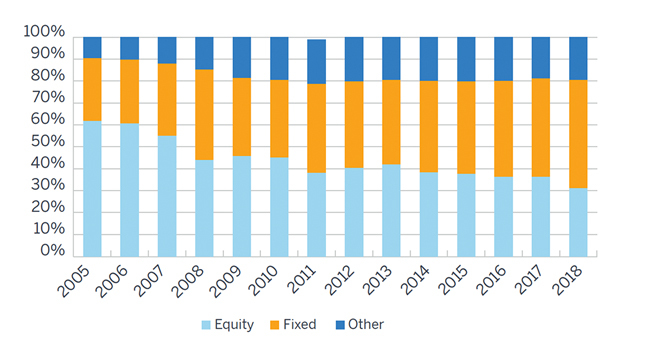 Since 2008, pension plan asset allocations to equities decreased to about 31.0%, from about 43.9%, while fixed income allocation has increased to about 49.4% from about 41.4%. While the $57.5 billion contributed for 2018 was high, it was still a decrease when compared with about $62 billion in 2017 contributions. Pension expense in FY2018 declined by $4.1 billion to $16.2 billion, from $20.3 billion in FY2017. One may reasonably conclude that pension expense will increase in FY2019 because of the poor FY2018 asset performance. Detailed comments and illustrations follow in the remainder of the 2019 PFS. Various tables with historical values can be found in the Appendix, including a newly added table in this year’s study which provides pension plan figures classified by business sector for the Milliman 100 companies. The first nine months of 2018 saw rising U.S. equity markets and rising discount rates. Plan assets climbed while liabilities fell. But the 4th quarter of 2018 brought plummeting equity markets and a halt to rising discount rates. We estimate that the funded ratio of the Milliman 100 plans climbed above 91.0% on September 30 before falling to 87.1% by December 31. With the average discount rate rising by 58 basis points during 2018 for the calendar fiscal year plans, we estimate that their pension liabilities decreased approximately 5% on an economic basis (due to the passage of time and changes to discount rates, ignoring benefit payments and accruals). Plans with significant allocations to fixed income as part of a liability-driven investment (LDI) strategy typically have allocations to long-duration high-quality bonds. During 2018 these bonds lost approximately 5% due to rising yields—closely tracking the decrease in pension liabilities. Interestingly, U.S. equities lost a similar amount, while non-U.S. equities lost significantly more. Cash and short duration fixed income were among the only asset classes to avoid losses during 2018. Rates of return earned in 2018 for the 84 companies sponsoring pension plans with calendar fiscal years ranged from -10.2% to 2.4%, with an average of -3.9%. Only two plans earned a positive return. Returns mostly fell in the -6.5% to -1.5% range (70 plans), with eight plans earning returns below -6.5% and six plans earning returns above -1.5%. Generally, plans with greater allocations to equities earned lower returns. 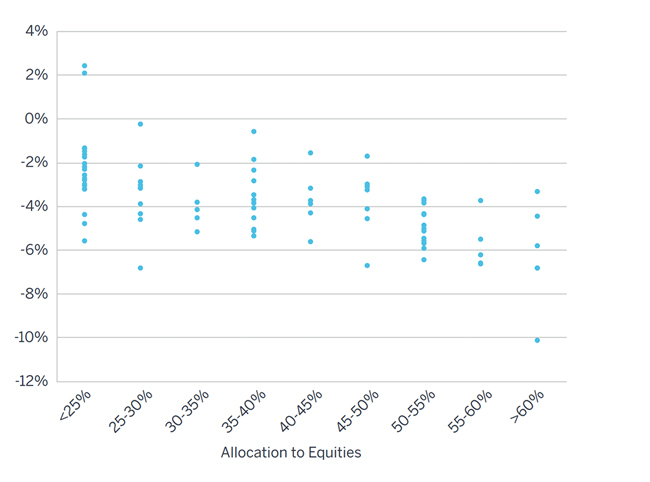 The 24 plans with equity allocations of at least 50% earned an average return of -5.5% while the 20 plans with equity allocations below 25% earned an average return of -2.3%. Equity allocations in the pension portfolios fell to an average of 31.0% by the end of 2018. The companies comprising the Milliman PFS have generally shifted toward higher allocations of fixed income investments. This trend has surfaced as plan sponsors shifted allocations to de-risk their pension plans over the past decade. 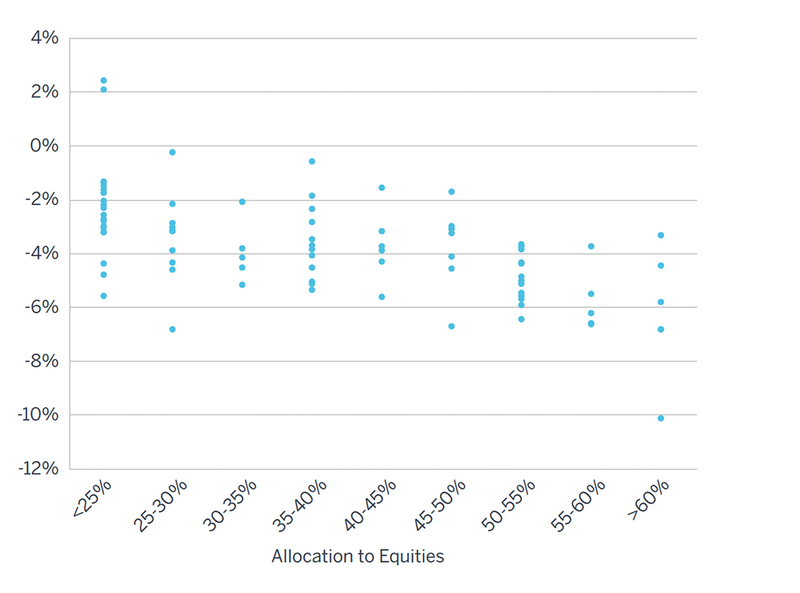 The actual asset return for the plan sponsor with the highest allocation to equities (74.5%) was -6.9%, which was worse than the return of -1.4% for the plan sponsor with the lowest allocation to equities (5.3%) in 2018. The highest asset return among all companies with calendar fiscal years was 2.4%, while the lowest was -10.2%. In prior years, investment allocations made by plan sponsors had showed a trend toward implementing LDI strategies. Generally, this involves shifting more assets into fixed income positions. This trend appears to have continued in 2018. The percentage of pension fund assets allocated to equities, fixed income, and other investments was 31.0%, 49.4%, and 19.6%, respectively, at the end of FY2018, compared with 36.1%, 45.0%, and 18.9%, respectively, at the end of FY2017. Unlike in FY2017, when plans with high allocations to fixed income (over 50%) underperformed the other plans (10.6% average return compared with 14.6%), in FY2018 the plans with high allocations to fixed income outperformed the other plans (-2.6% compared with -4.4%). Over the last five years, the plans with consistently high allocations to fixed income have slightly outperformed the other plans while also experiencing lower funded ratio volatility. 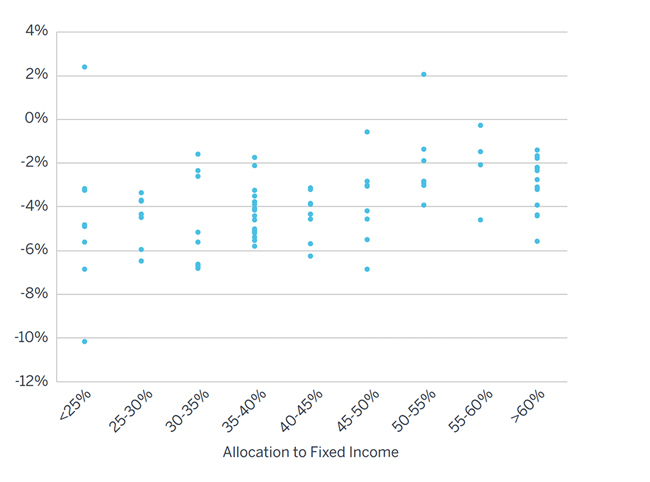 Among the 84 companies in the Milliman PFS with calendar fiscal years, 23 pension plans had fixed income allocations greater than 40.0% at the end of FY2013 and maintained an allocation of at least 40.0% through FY2018. Over this five-year period, these 23 plans experienced lower funded ratio volatility than the other 61 plans (an average funded ratio volatility of 3.5% versus 5.3% for the other 61 plans) while earning a slightly higher five-year annualized rate of return (an average of 6.1% versus 5.2%). Plans with at least 50% in fixed income have outperformed other plans over each of the last five years with the exception of 2017. Overall, allocations to equities decreased during FY2018, resulting in an average allocation of 31.0%—the lowest equity allocation in the 19-year history of the Milliman PFS. None of the 100 companies had increases to their equity allocations of more than 10.0% in 2018. Seventeen companies decreased their equity allocations by more than 10.0% in 2018, compared with one company in 2017, three in 2016, four in 2015, 12 in 2014, five in 2013, four in 2012, and 10 in 2011. Overall allocations to fixed income increased in FY2018, resulting in an average allocation of 49.4%. Only one company had a decrease of more than 10.0% in its fixed income allocation. Eighteen companies, however, increased their fixed income allocations by more than 10.0% in 2018, compared with three in 2017, four in 2016, three in 2015, seven in 2014, four in 2013, two in 2012, and six in 2011. Other asset classes include real estate, private equity, hedge funds, commodities, and cash equivalents. More specific details on how investments are allocated to the other categories are generally not available in the U.S. Securities and Exchange Commission (SEC) filings of the companies. Overall, allocations to other asset classes remained stable in FY2018. Six companies increased their allocations by 5.0% or more to other asset classes during 2018. For comparison purposes, we have looked at historical changes since FY2005, the first year when the Milliman 100 companies consistently made allocation information available. The allocation to equities was down from 61.7% and the allocation to fixed income instruments was up from 28.6% at the end of FY2005. The percentage of investments in other asset classes was also up from the 9.7% allocation at the end of FY2005. Similar to the past few years, plan sponsors continued to execute pension risk transfer (PRT) activities in FY2018 as a way of divesting pension obligations from their defined benefit (DB) plans and corporate balance sheets. Large-scale pension buyout programs were transacted for four of the Milliman 100 companies, as pension assets and liabilities were transferred to insurance companies. International Paper, Entergy Corporation, Lockheed Martin Corporation, and FedEx reported transactions of $1.7 billion, $1.8 billion, $1.8 billion, and $6.2 billion, respectively. The 2018 PRT market was considerably more active when compared with the 2017 market. Extracting the dollar volume of PRT activities from Form 10-K disclosures is an estimate and it appears that the reported dollar volume in FY2018 was $18.8 billion, an increase of $6.0 billion compared with the FY 2017 reported dollar volume of $12.7 billion. PRTs are deemed by plan sponsors to be an effective way to reduce a pension plan’s balance sheet footprint, but generally they have an adverse effect on the plan’s funded status, as assets paid to transfer accrued pension liabilities are higher than the corresponding actuarial liabilities that are extinguished from plans. Much of this incongruity stems from Internal Revenue Service (IRS) pension plan valuation rules differing from an insurance company’s underwriting assessment of these same liabilities. In the past few years, we’ve reported that a more prevalent de-risking measure came in the form of a “lump-sum window” program, in which some plan sponsors settled the pension obligation by distributing payments to specific groups of former participants. In March, the IRS issued Notice 2019-18, in which restrictions imposed on lump-sum settlements to retirees and their beneficiaries were lifted (IRS in effect nullified Notice 2015- 49). We anticipate that plan sponsors may avail themselves of this strategy as they move ahead with pension de-risking. The FY2018 funded ratio of 87.1% was lower than we reported in the January 2019 Milliman 100 Pension Funding Index (PFI). 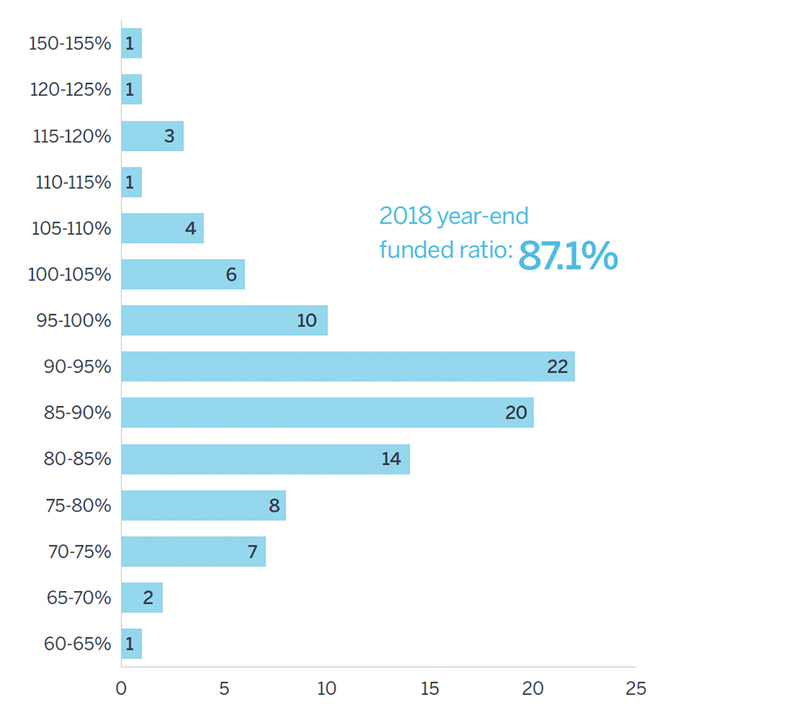 The January 2019 PFI funded ratio of 89.7% was based on data collected for the 2018 Milliman Pension Funding Study. This revised funded ratio of 87.1% from our current study reflects the collection and collation of publicly available information. Discount rates used to measure plan obligations, determined by reference to high-quality corporate bonds, increased during 2018, thereby decreasing liabilities. The average discount rate increased to 4.01% at the end of FY2018 from 3.49% in FY2017. For historical perspective, discount rates have generally declined from the 7.63% reported at the end of FY1999. Over the last decade, discount rate improvements have only occurred during three fiscal years (2013, 2015, and 2018). The decrease in the PBO due to the higher discount rates was able to offset the poor investment returns of -2.8%. The net result of investment returns, discount rates, contributions, and settlements was an increase in the funded status. The FY2018 funding deficit of $215.0 billion is a $41.5 billion improvement over the year-end 2017 funding deficit. The discount rate increase and the high contributions resulted in the first time in this study that we’ve seen funded status improve in a year with asset returns less than 0%. Pension expense—the charge to company earnings—decreased to $16.2 billion in FY2018 as compared with $20.3 billion during fiscal year FY2017, a $4.1 billion decrease. The peak level of pension expense occurred in FY2012, when it was $56.5 billion. Based on recent and prior year disclosures, we estimate that a majority of the Milliman 100 companies are using a “spot rate” approach for estimating the service and interest cost components of net periodic benefit costs. The “spot rate” approach is a refined use of the individual “spot” interest rates on the corporate bond yield curve used to develop the actuarial liabilities or PBO. This contrasts with the measurement of PBO utilizing a customized bond matching model. The plan sponsor can choose to use only one of the valuation methodologies, and cannot change it unless there is agreement with the auditors to do so. For an upwardly sloping yield curve, the use of a “spot rate” method is expected to lower the “interest cost” component of pension expense, thus lowering the total pension expense in comparison with using the former single-weighted average discount rate methodology. This method leads to an expectation of PBO losses when the PBO is remeasured at the end of FY2018 for pension disclosure. The effect of an increase of 52 basis points in discount rates helped to offset the poor investment returns during FY2018 and the impact of PRT activity. The net 7.8% decrease in pension obligations generated by the increase in discount rates (at a median rate of 4.01% at year-end 2018, up 52 basis points from 3.49% at year-end 2017), along with PRT activity and revisions to the life expectancy assumptions used to measure pension plan obligations, resulted in a liability decrease of $141.3 billion. The 2.8% investment loss (actual weighted average return on assets during FY2018) resulted in a decrease of $99.9 billion in the market value of plan assets after including the high contributions and approximately $19 billion paid out in annuity purchases or lump-sum settlements. The Milliman 100 companies had set their long-term investment return expectations to be, on average, 6.6% during FY2018 down from the expectation of 6.8% set for FY2017. The funded ratio of the Milliman 100 pension plans increased during FY2018 to 87.1% from 85.8% at the end of FY2017. Readers should note that not all of the 100 companies have a fiscal year 2018 that corresponds to calendar year 2018. In order to recognize that difference, we report a funded ratio of 86.6% for plans with calendar fiscal years in 2018, up from 85.7% for 2017. Sixteen companies have different fiscal year starting dates. Their funded status at the end of FY2018 is 92.3%. The aggregate pension deficit decreased by $33.0 billion during these calendar year companies’ 2018 fiscal years to $202.9 billion, from an aggregate deficit of $235.8 billion at the end of FY2017. For fiscal year 2018, funded ratios ranged from a low of 61.4% for American Airlines to a high of 150.9% for NextEra Energy, Inc. The 1.3% increase in the FY2018 funded ratio added to the big improvement seen in FY2017. 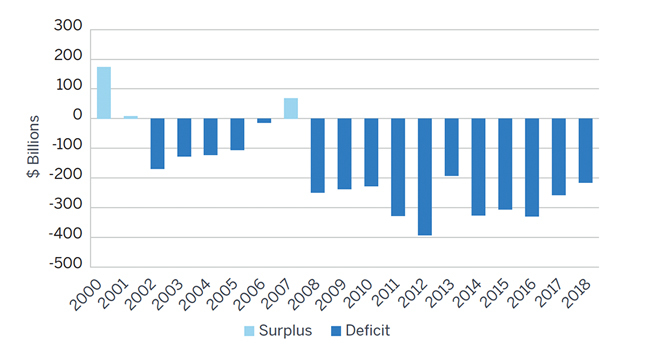 Note that there has not been a funding surplus since the 105.7% funded ratio in FY2007. Twelve of the 84 Milliman 100 companies with calendar fiscal years reported surplus funded status at year-end 2018, compared with 12 companies in 2017, seven in 2016, nine in 2015, eight in 2014, 19 in 2013, and six in 2012. These numbers pale in comparison with the 46 companies with reported surplus funded status at year-end 2007. Thirty-six of the Milliman 100 companies with calendar fiscal years reported an increase in funded ratio for 2018, compared with 77 for 2017. There was a net decrease in FY2018 pension expense: a $16.2 billion charge to earnings ($4.1 billion lower than in FY2017). This is well below the $56.5 billion peak level in FY2012. Thirty-one companies recorded FY2018 pension income (i.e., a credit to earnings). Twenty-three companies recorded income in FY2017 and 19 companies in FY2016, up from eight in FY2012. The aggregate 2018 cash contributions of the Milliman 100 companies were $57.5 billion, a decrease of $4.5 billion from the $62.0 billion contributed in 2017, and only $4.6 billion less than the 2012 record high level of $62.1 billion. Contributions had started to increase in 2016 to $42.7 billion from the amounts contributed in 2015 and 2014 ($31.3 billion and $40.2 billion, respectively). The total market capitalization for the Milliman 100 companies decreased by 11.0%, which offset the decrease in pension obligations (due to higher discount rates). This resulted in a decrease in the unfunded pension liability as a percentage of market capitalization of 3.0% at the end of FY2018, compared with a decrease of 3.1% at the end of FY2017. Pension deficits represented less than 10.0% of market capitalization for 82 of the Milliman 100 companies in FY2018 and 85 of the Milliman 100 companies in FY2017. This is also an increase from FY2013, when 79 companies had deficits that were less than 10.0% of their market capitalizations. Since FY2011, we have had investment returns exceeding expectations in five out of eight years, which has resulted in elevated levels of market capitalization. In FY2018, one company’s plan deficit exceeded 50.0% of market capitalization, down from two companies in FY2015. This is down from nine in FY2012 and FY2011, the year we first started tracking this figure. The weighted average investment return on pension assets for the 2018 fiscal years of the Milliman 100 companies was -2.8%, which was below their average expected rates of return of 6.6%. 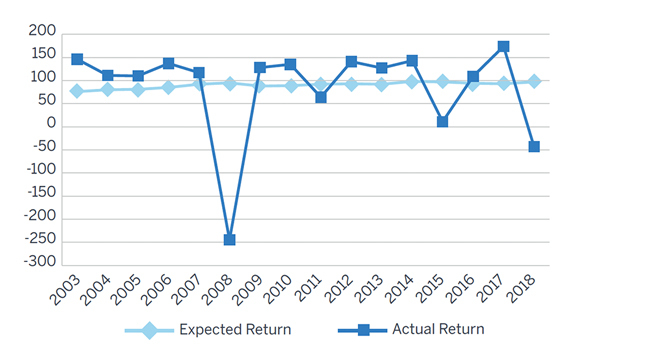 Two of the Milliman 100 companies exceeded their expected returns in 2018, both with off-calendar fiscal years. Ninety-eight companies exceeded their expected returns in 2017 and 67 in 2016. However, only four companies exceeded their expected returns in 2015 and all four had off-calendar fiscal years. But 82 companies in 2014 exceeded their expected returns compared with 81 in 2013, 93 in 2012, 23 in 2011, and 99 in 2010. At the end of FY2018, total asset levels were $1.448 trillion. This is $166 billion above the value of $1.282 trillion at the end of FY2007, prior to the collapse of the global financial markets. During FY2018, investment losses, annuity purchases, and lump-sum settlements were partially offset by contributions but decreased the market value of assets by $99.9 billion. The Milliman 100 companies’ estimated investment loss for FY2018 was $43.2 billion compared with the expected return of $97.4 billion, a difference of $140.6 billion. For the five-year period ending in 2018, investment performance had averaged 5.6% compounded annually (only considering plans with calendar fiscal years). 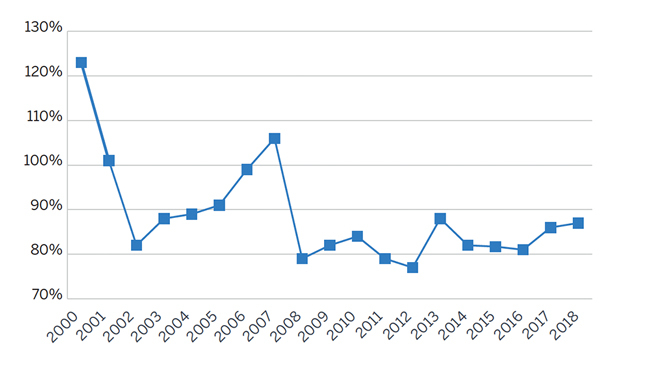 This was only the fourth year of investment losses over the past 19 years (prior three were 2001, 2002, and 2008), contributing to an annualized investment return of 5.8% over that period (only considering plans with calendar fiscal years). Companies continued to lower their expected rates of return on plan assets to an average of 6.6% for FY2018, as compared with 6.8% for FY2017, 7.0% for FY2016, 7.2% for FY2015, 7.3% for FY2014, 7.4% for FY2013, 7.6% for FY2012, 7.8% for FY2011, and 8.0% for FY2010. This represents a significant drop from the average expected rate of return of 9.4% back in FY2000. Like last year, none of the Milliman 100 companies utilized an expected rate of return for FY2018 of at least 9.0% (the highest was 8.97%). Only one company had utilized an expected rate of return of at least 9.0% in 2016, 2015, 2014, and 2013, whereas three companies also assumed an expected rate of return of at least 9.0% in 2012, 2011, and 2010, but this was down from five in 2009 and a high of 83 in 2000. With tax reform in place, lowering future deductibility of contributions made for plan years after 2017, and given the large amounts of contributions seen over the past two years, the expectation is for employer contributions to decrease in 2019. If funding levels improve, we expect plan sponsors to continue to engage in pension de-risking activity as they shed equity risk and explore further asset-liability matching (ALM) and risk-hedging strategies. However, we do expect equity levels to rise from their depressed levels at the end of 2018, assuming the strong investment performance witnessed during the first quarter of 2019 continues. Further pension risk transfer activities are likely to occur in the form of lump-sum windows and pension lift-outs as rising PBGC premiums remain a concern for plan sponsors. * The Milliman 100 companies were classified based on the business sector listed for them on Yahoo Finance. Who are the Milliman 100 companies? The Milliman 100 companies are the 100 U.S. public companies with the largest defined benefit (DB) pension plan assets for which a 2018 annual report was released by March 25, 2019. This 2019 report is Milliman’s 19th annual study. The total value of the pension plan assets of the Milliman 100 companies was more than $1.44 trillion at the end of FY 2018. The results of the Milliman 2019 Pension Funding Study (PFS) are based on the pension plan accounting information disclosed in the footnotes to the companies’ Form 10-K annual reports for the 2019 fiscal year and for previous fiscal years. These figures represent the GAAP accounting information that public companies are required to report under Financial Accounting Standards Board (FASB) Accounting Standards Codification Subtopics 715-20, 715-30, and 715-60. In addition to providing the financial information on the funded status of their U.S. qualified pension plans, the footnotes may also include figures for the companies’ nonqualified and foreign plans, both of which are often unfunded or subject to different funding standards from those for U.S. qualified pension plans. The information, data, and footnotes do not represent the funded status of the companies’ U.S. qualified pension plans under ERISA. Sixteen of the companies in the 2019 Milliman Pension Funding Study had fiscal years other than the calendar year. The 2019 study includes five new companies to reflect mergers, acquisitions, and other corporate transactions during FY 2018. 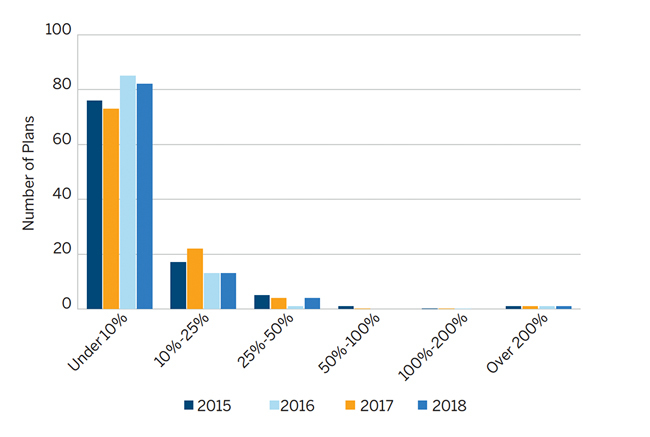 Figures quoted from 2018 reflect the 2019 composition of Milliman 100 companies and may not necessarily match results published in the 2018 Milliman PFS. Generally, the group of Milliman 100 companies selected remains consistent from year to year. Privately held companies, mutual insurance companies, and U.S. subsidiaries of foreign parents were excluded from the study. The results of the 2019 study will be used to update the Milliman 100 Pension Funding Index (PFI) as of December 31, 2018, the basis of which will be used for projections in 2019 and beyond. The Milliman 100 PFI is published on a monthly basis and reflects the effect of market returns and interest rate changes on pension funded status.